The novel is bookended by Rebecca’s time in prison but it is the backstory that I couldn’t put down. Rich in period details but narrated in the present tense to create a sense of immediacy, the book brings Rebecca to life as we learn the extraordinary events which led to her imprisonment. She was born into poverty in pre Federation Sydney, where her father had died when she was small. Her mother Lizzie is too proud to accept charity and has supported her six children with fine needlework, but they are often still hungry. One by one they all leave school as soon as they can, the girls helping with the sewing and minding Ruby who at fifteen still has the mind of a child, and Louis losing a succession of jobs for reasons as colourful as his clothes. Helen dies of a cough that will not shift. For women, there were few options to escape this drudgery. Lizzie won’t accept the money that Violet makes in her gaudy clothes because it is sinful money, while Amy marries into a comfortable home where the only liability is her philandering husband. And fatefully, Rebecca meets Don Sinclair, a charming man with a bit of money to splash around. It would spoil the story to tell much of it: suffice to say that a time comes when Don thinks that the work his mother does in her ‘private hospital’ is easy money, and that Rebecca’s need to support her child makes her too weak to withstand him. The real strength of this novel is the characterisation of Rebecca, a flawed woman who makes too many compromises. She realises early on that she has made a mistake with Don, but she is trapped by her pride and her unwillingness to retreat home into poverty. PS Sue at Whispering Gums enjoyed it too. 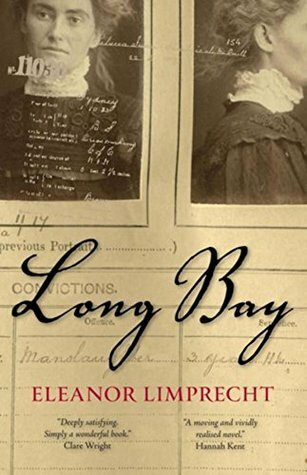 PPS And see an interview with Eleanor Limprecht at Adventures in Biography, thanks for the link Michelle! Sadly this is available in uk only as a kindle version. Maybe if I hang on if will come out in paperback which I’d prefer. I suspect not… Sleepers is a very small indie publisher and they may not have the reach to do print copies overseas. But you could ask them, they’d probably be delighted to know that this book interests you over there in the UK! See http://sleeperspublishing.com/about/ for contact details. Yes, that’s what I thought too. I read this book last year and found it fascinating. Women really didn’t have choices and men had so many! I was surprised that Rebecca could keep her baby in jail. Obviously details were well researched and woven well into a good read. Like Meg, I read this last year. I had a few quibbles too, partly because I can’t help thinking Limprecht was a little hampered by knowing Rebecca’s family would be reading the novel. (That’s my assumption, not something Limprecht herself has said). However, I enjoyed it immensely. Her evocation of the period and particularly of women’s lives makes for excellent reading. That’ll teach me not to write reviews in the middle of the night, I knew you’d read it (that’s why I bought it) but I forgot to link! Another one to add to my wishlist – great review Lisa. LOL, I think I’ve been a bad influence on your budget! I’ve just signed up to an audiobook provider as I’m unable to keep up with all of the books I want to read! How will you listen? while you’re driving? Or ironing? Or just loafing in the sun? I listen when I’m driving and gardening. And if no-one’s in the house I also listen when I’m doing housework. I’ve listened to 5 audiobooks so far this year – it works well for me but the libraries (and I am a member of 3) have fairly limited selections. Yes, I suspect they are clearing their stock down because so many people have books on iPods instead. Although I couldn’t put this book down at the time, it did miss the mark a little for me in terms of what I look for in historical fiction – I didn’t get a strong sense of place unfortunately. I was also reading it with Kate Manning’s My Notorious Life in mind – a similar book (which was extremely evocative of time and place). Worth looking up – a ripping read.